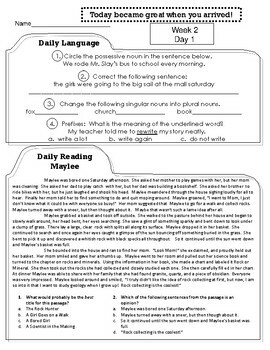 This morning work features 16 reading passages as a quick review for fluency, comprehension, vocabulary, etc. There are also 2 constructed response questions each week for students to have weekly, constant constructed response review to prepare for standardized testing. All reading passages correlate with 3rd grade standards. Each non-fiction passage accompanies third grade social studies and science standards as well, so it integrates across curriculum. Each week contains the same passage for every day that week, which will give 16 total reading passages. This helps with fluency, which correlates with ELACC3.RF.4: Read with sufficient accuracy and fluency to support comprehension. 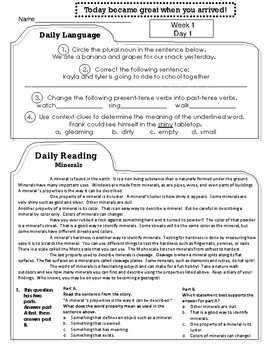 Comprehension will be addressed through multiple choice questions as well as constructed response questions. 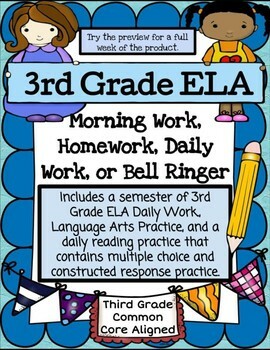 This is the perfect morning work, homework, bell ringer, daily work, etc. for a third grade ELA classroom. A great routine to start with each day or class period, or a great way to sum up learning. Please let me know if you have any questions. 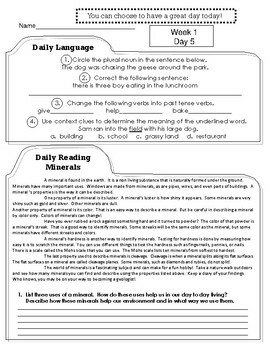 The language arts morning work is associated with the 3rd grade daily language/math. Constructed response is such a key for standardized testing, and this is the perfect way to practice and assess this standard and objective weekly. PLEASE CHECK OUT THE PREVIEW FOR A FREE FULL WEEK OF MORNING WORK!! The preview also contains the Unit overview complete with skills and standards that will be addressed. E-mail me at katiewillisbc@gmail.com with any questions!